We’re going to close the blog for the evening, pending the confirmation of final results. The results thus far have not been adjusted for potential disqualifications or point penalties. We’ll post the final score table when the official announcement comes through in the next day or two. This should include the winner of the overall Inward Bound Trophy. Congratulations to all runners for their efforts today, and thank you for joining us on the liveblog. We’ve received word that the remaining two teams – Div 5 from Fenner and UniLodge – are being picked up. Those teams would have run a massive distance due to their doubling back. Fantastic effort, everyone! It looks like Griffin Div 2 has pulled out. Fenner and UniLodge Div 5 are still going, though both teams look to have gone in small circles for the past hour or so. Our reporter at the scene has returned to civilisation and internet connectivity. Here’s Burgmann Div 1 winning their division and the Bill Packard Trophy. The board shows some nail-biting finishes. 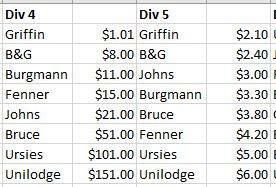 Bruce beat B&G to 3rd place in Div 7 by just one minute; Ursies was only three minutes behind Johns in Div 2; and Griffin and B&G in Div 5 both finished at 9:40. There would have been some real races to the finish line! Please also note that this is before the imposition of any time or point penalties. There were some really close finishes – more on that later. We’ve just received word that many Div 5 teams have been disqualified. Apparently the southern route is the one that was supposed to be taken. 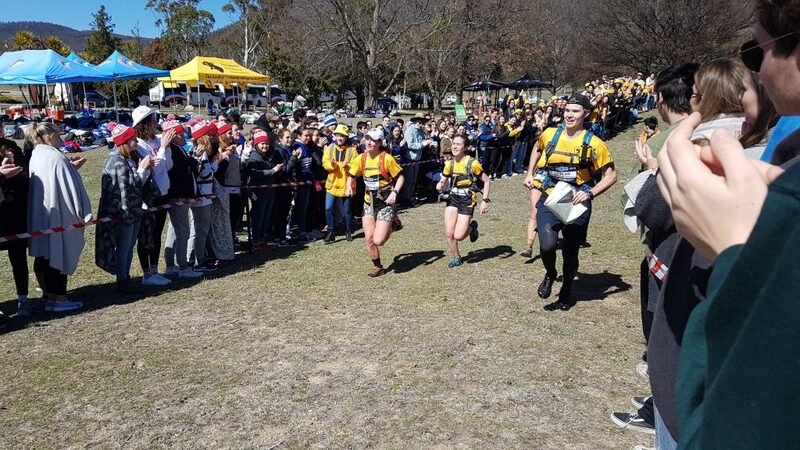 Most teams went north, however, and apparently planned their routes to avoid a specific exclusion zone, which would have caused disqualification. However, this meant running through private property, which also carries a disqualification penalty. Teams were apparently notified of their disqualification part-way through the run. This was at about 5am today; Fenner and Unilodge then doubled back to the same route as Div X. This might explain why Fenner and UniLodge doubled back. It’s not clear at this stage whether they have also been disqualified, or whether it was just those teams who stayed on the northern route. Let’s have a look at the results, now that almost all teams have finished. 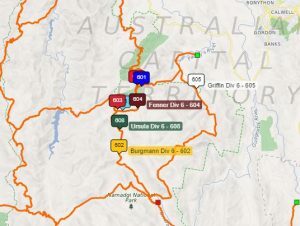 Burgmann appears to be dominating, having won Divs 1, 6, 7, and maybe 2 (they were very close to B&G so I cannot tell from the tracker). B&G is doing quite well. They came 1st/2nd in Div 2, 1st of the point-scorers in Div 3 (behind the Div X team), 3rd in Div 6, 2nd/3rd/4th in Div 5 (sorry, it’s too close for me to call), and 3rd/4th in Div 7. Johns is another strong hall. They were 3rd or 4th in Div 2, 2nd in Div 3 (excl. Div X), 3rd in Div 4, 1st in Div 5, and 2nd in Div 7. Ursies is doing better than the previously-posted odds would suggest. They were 2nd in Div 1, 3rd or 4th in Div 2, and 2nd in Div 6. Remember that higher divisions are worth more points than lower divisions. Additionally, points may be deducted for rule infractions. 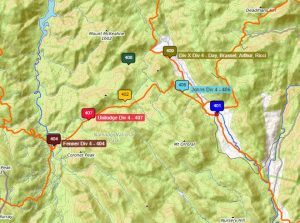 UniLodge Div 6 has made it to End Point! They picked a misc route, but got there in the end. That means all of Div 6 is back, leaving just four teams still running. FYI, all teams must be at End Point by 7pm. 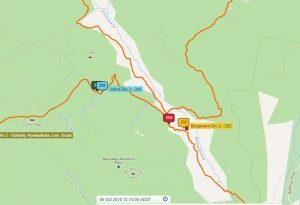 If they think that they will arrive after that but can still make it in at a reasonable time, they can make arrangements with the Race Director, but must do so before 6pm. I’ts not unusual to have teams finish at 8 or 9, but generally much later than this isn’t allowed – running through two nights would not be a good time. The last Div 5 team has come in! It appears we just have one Div 2 team, two each from Divs 4 and 5, and one Div 6 team still out running. All Div 7 teams have completed the course! Congratulations to the runners. Not sure what UniLodge Div 6 is doing here. Hopefully they head in the right direction. All Div 1 teams have reached End Point! 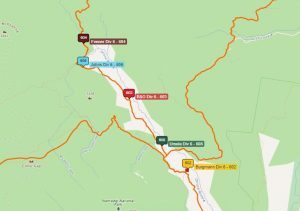 It appears that all except Fenner managed to complete the whole route. 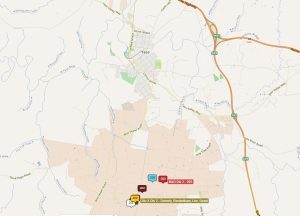 Ursies Div 4 has done a bit of an odd detour, going north of the usual path. This appears to have been a smart move – they look to have overtaken Burgmann as a result. 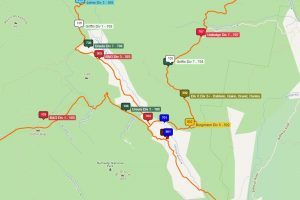 Joel tells me that the route Ursies took would have been a bit of an easier run. We’ve spoken to our resident IB expert, Joel, to get his thoughts about what’s happening. Joel has run and coached IB. He thinks it will take at least five hours for Fenner Div 5 to finish, and longer for UniLodge. This is based on how long it took Div X to do the same oute, so the teams may take even longer due to tiredness. “I just don’t understand why they doubled back on themselves,” he said. All Div 7 teams have reached End Point! Bruce has won Div 4! They narrowly beat B&G, who took a different route. 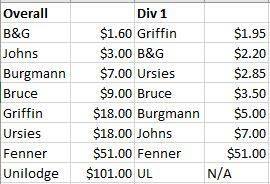 Bruce took the path where the Div X team is, whereas B&G took the same route as Johns is taking. Burgmann also appears to have won Div 6! B&G are also at End Point but I think they withdrew. Just noticed this on the gear checklist. I wonder if any particular incident inspired this note. A midday update for everyone following along at home. Div 1: Most teams have finished. Fenner appears to have pulled out. B&G is very close to End Point. Bruce and Johns still have a while to go. Div 2: No teams have finished yet. Burgmann is very close. Griffin and B&G are behind the main packs, with B&G having been stationary for a while. Div 3: Baldwin’s Div X team came in first, with B&G and Johns not far behind. Griffin has seemingly withdrawn. The other teams are on the right track and should come in steadily. Div 4: No teams have reached End Point yet. B&G and Bruce are in the lead. Div 5: Most teams are in. The two Div X teams are still going but are not super far off. Fenner and UniLodge are way back, having doubled back on themselves early on. Div 6: No teams have finished yet. Burgmann looks set to win, followed by Ursies, then B&G. Most of the other teams are on this same route, but Griffin is off on a different path. 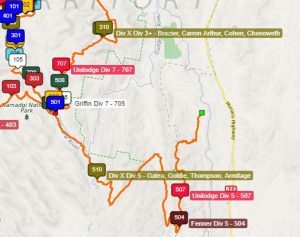 Div 7: Unilodge is approaching End Point. Fenner and a Div X team are still going, but apart from that, everyone has finished. Div 5 is interesting. A lot of teams have come in, but some are way back. 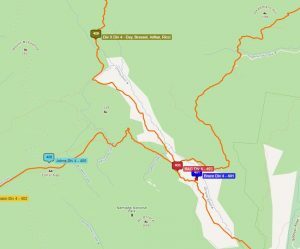 The expected route had them going south, but most teams started out going north. 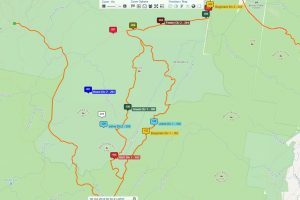 The teams that stayed on that route met up with Div 7 and made good time. However, UniLodge and Fenner turned around and went south. They and the Div X team on that route still have a fair distance to go. Div 6 has also not seen any finishers. Ursies and Burgmann are both doing well there. Burgmann is out in front after seemingly going off the expected path a few times – perhaps some quicker, small trails. No teams have completed Div 4 as yet. 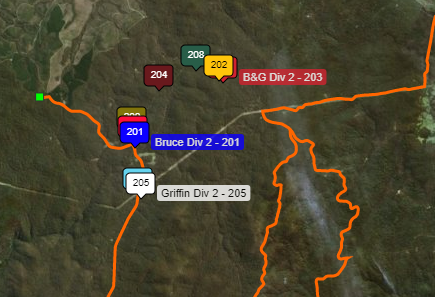 B&G is leading the main pack there, but Bruce looks to have taken a different route (along with a Div X team) and might be able to reach End Point first. We’ve not seen anyone from Div 2 finish yet. Burgmann looks to be out in front, with Ursies and Johns leading the south-west pack. It looks like we may have had a few teams pull out. This is commonly due to injury, but can also occur if a team is hopelessly lost. If they want to pull out, teams open the infamous “yellow envelope”. This contains safety instructions and information about where teams were dropped. All teams carry a phone for emergencies, and this can be used to call to request a pick up. Judging by their speed to End Point, it looks like Fenner Div 1 pulled out after some intense bush-bashing. Griffin Div 3 also looks to have withdrawn. As expected, David Baldwin’s Div X team in Div 3 looks to be ahead. B&G isn’t far behind – they’ve taken a different route. Apologies for the delay, folks – it looks like there isn’t reception at End Point. 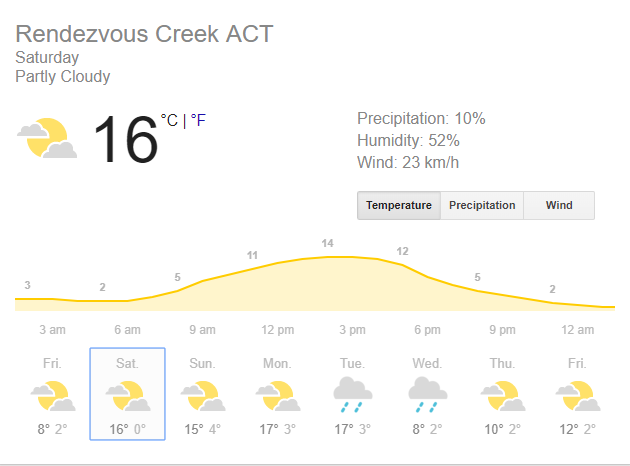 Canberra crew is taking over. 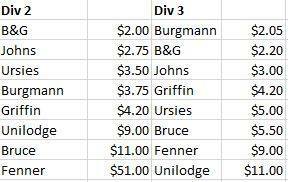 We’ve had a few teams finish, with Burgmann looking to have taken out first in Div 1. Also finished, or very close to, are Div 5 from John’s, Bruce, Griffin, and Burgmann. 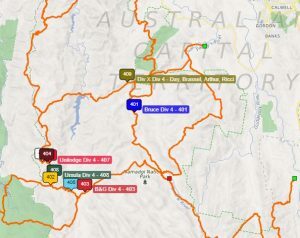 B&G, Burgmann and Bruce Div 7 teams are also at End Point. 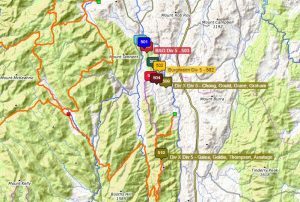 Tomorrow, we’ll continue to liveblog the race – hopefully there will be reception at Endpoint so we can provide updates from the ground. If not, we’ll have a team back in Canberra who will continue the liveblog from the online tracking. 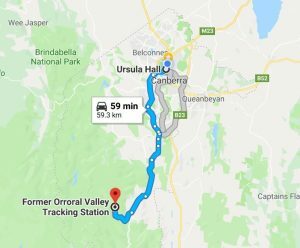 Reminder that Endpoint is at Orroral Valley Tracking Station, in Rendezvous Creek, ACT. 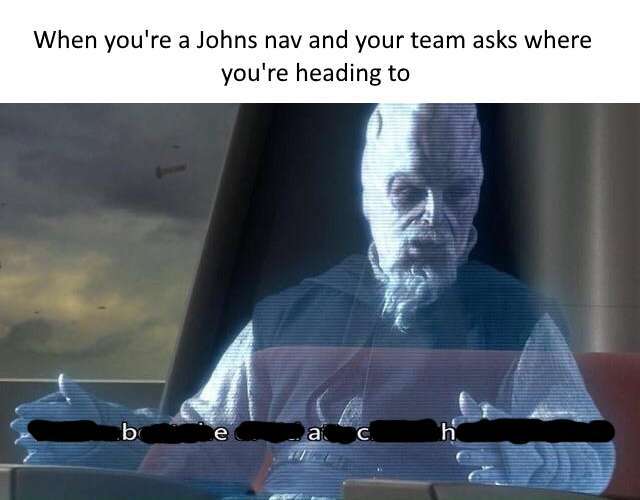 It’s about an hour’s drive away. Remember if you’re driving you can’t arrive between 7 and 9AM. 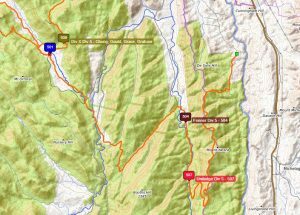 You can follow the runners live overnight here, and you can also download the app to your phone to do so tomorrow if we have signal. If you’re driving, though, please have an early one, and be safe on the roads tomorrow. Here’s the current state of play as we pause the blog for the night. Div 2 has split into two distinct groups, and Div 1’s teams are taking a variety of routes. Div 3 has started moving, though Griffin appears to be behind. 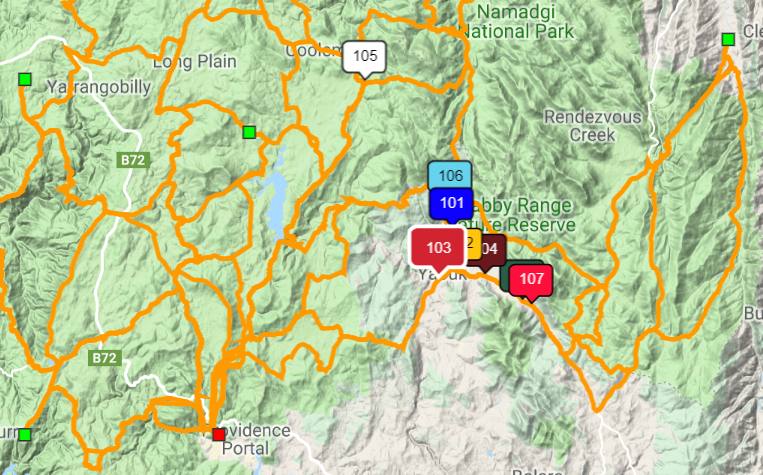 The other divs have not yet arrived at their drop points. Thanks for joining us today, and looking forward to a great day of IB tomorrow! It looks like Bruce and Griffin Div 1 have gone their separate ways. 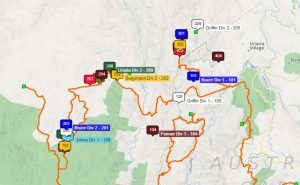 Griffin is heading South towards the Div 4 route. Bruce, on the other hand, is heading North. 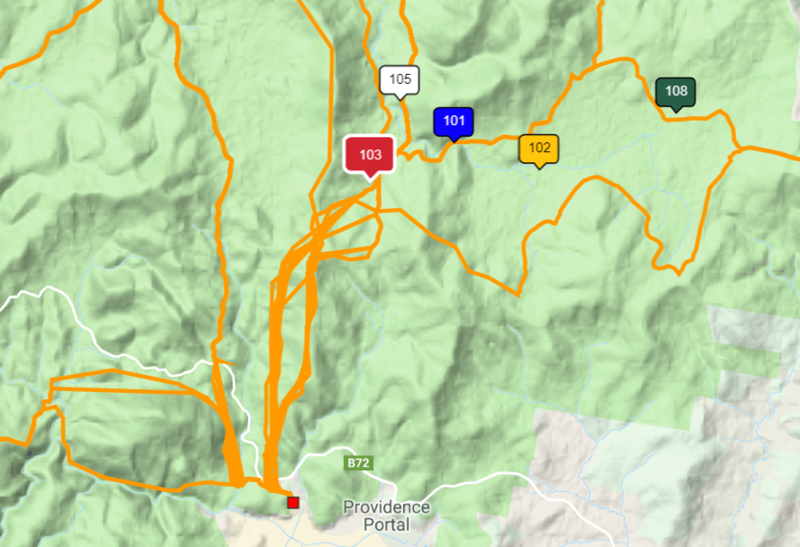 This seems inefficient, but the lower orange line seems to involve some rather steep elevation, so the longer but easier route could be wise. Div 3 is off and running. Most teams are packed quite closely together, which makes sense given the early point of the race and the uniform expected route. According to a former runner and coach, the way Div 6 will run is somewhat nasty. It apparently involves pine forests and an uphill slog. 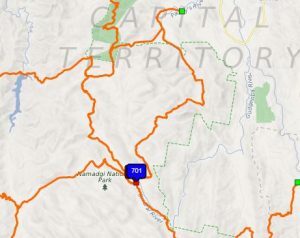 On the plus side, the recommended route involves a scenic run past Gibraltar falls. It will be interesting to see how the runners fare. Some Div 1 and Div 2 teams are heading on the same paths. The other Div 2 teams in the north look to be heading in the same direction as Bruce and Griffin Div 1. Yaasss! Looks like some teams got to go on a fun detour north. Div 1 Update: Of the western pack, B&G seems to be in the lead. Bruce is just ahead of Griffin on the eastern trail. Fenner, in the bottom right quadrant, appears to be taking a smaller trail. 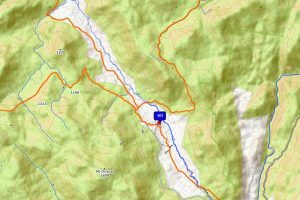 This could connect them up with a Div 4 main route, which you can see in orange. However, they’ll need to take care to not go into any unauthorised areas – trespassing is an instant disqualification. Luckily not all Observer reporters will be driving to End Point, meaning we can keep you updated for a little while longer. It looks like they’re really trying to confuse Div 5, 6 and 7 – the buses are going in the complete opposite direction to End Point. Drive safe tomorrow folks! Take care, there’s a lot of animals active on the roads at this time of year. If you’re signed up for the bus, college buses are leaving at 5:45, we believe. Check this with your college. 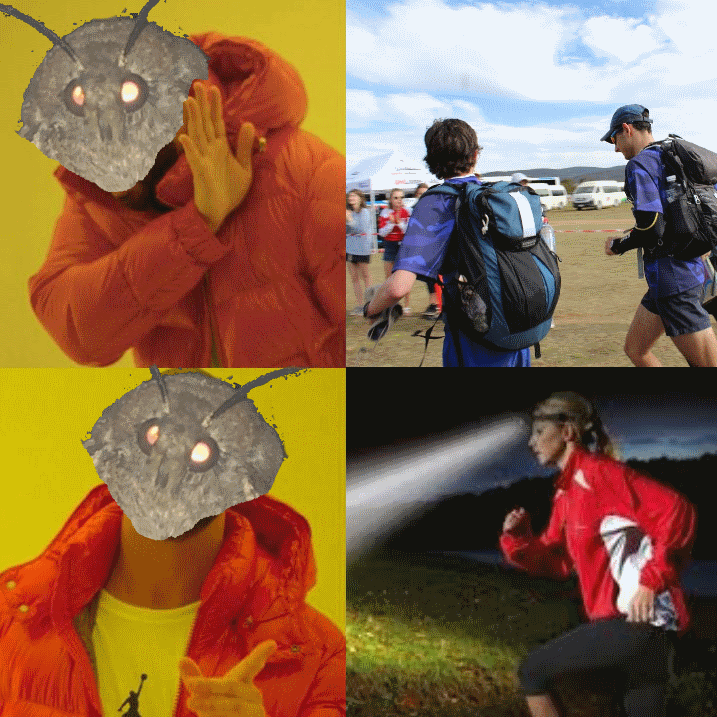 Alright, I’m off to bed. It’s looking like this song will be quite relevant for most runners. 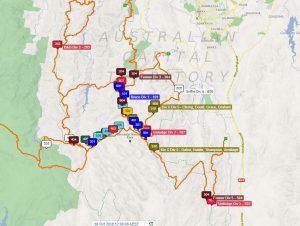 They’re going to be running through the Brinabellas, so it will be a fair bit of up and down. What’s happening with Div 2? As can be seen two posts ago, they’ve been dropped about 50km north-west of Endpoint. 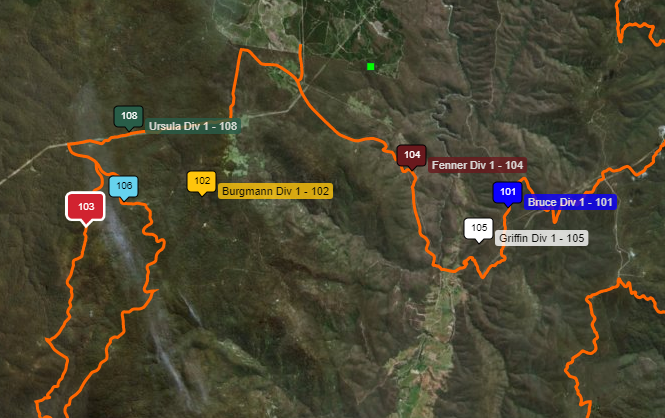 B&G, Burgmann, Ursies and Fenner look to be bush bashing east, with B&G and Burgmann seemingly in the lead. The other teams, including a Div X team, look to be heading south, with Griffin and Johns ahead there. What’s going on with Div 1? They’ve been dropped about 40km north-west of Endpoint, as may be seen in the previous post. That’s going to be a much further run, of course. Fenner, Griffin and Bruce have taken an eastern route, with Bruce and Griffin out ahead. Ursies, B&G and Johns have taken a westerly path, with B&G and Johns seemingly ahead there. 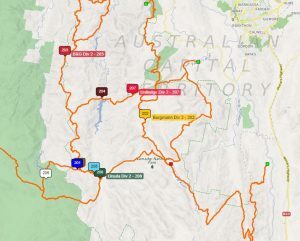 Burgmann, meanwhile, is splitting the difference to some extent as they bush bash south-west, but they seem likely to meet up with Johns’ route shortly. 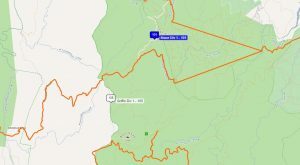 Here’s a map to End Point, for those of you not familiar with former NASA sites. 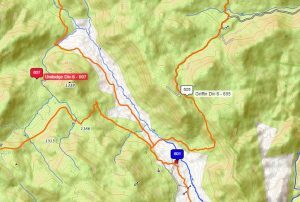 This is quite close compared to recent years, though in 2014 End Point was Cotter Dam – about a 30 minute drive from campus. And here’s our first shot of live race tracking. You can follow along yourself here. IB goes to Space! Well, not quite, unfortunately, but it should still be a very fun day, and it’s relatively close! And here’s the weather. It should be a fairly nice day, if a little on the cool side. No rain is expected. Here’s the directions to Endpoint. It’s only about an hour’s drive! Endpoint is the Former Orroral Valley Tracking Station, in Rendezvous Creek, ACT! Divs 6 and 7 are off! Now, we wait for Endpoint release. 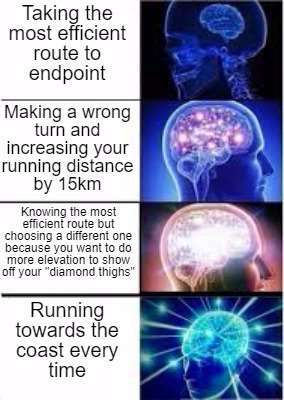 Context: the runners are often taken on needlessy long, convoluted journeys so that they can’t work out where they are going. We’ve just seen Div 5 go out. There are a number of Div X teams running in this division. Here’s the ‘odds’ for Divs 4 & 5, again from Inward Bound Memes for Long Distance Teens. We’ve heard reports that Div 1 just arrived at the drop point. That would mean they spent about seven hours on the bus, blindfolded. This year’s drop is a bit later, and the run-out was much earlier, than last year. 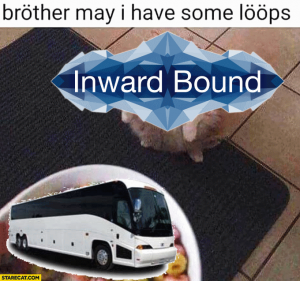 That could mean the drop is further away, or just that the bus did a lot of loopy bois. Fun fact, runners have to keep their blindfolds on even during bathroom breaks. This leads to some fun times. We’ve realised that some people following along at home may not know all the IB lingo, having not run the race or participated in residential life. If you’re feeling a bit out of the loop, here’s a brief explanation. Each hall can enter up to seven teams, running across seven divisions. 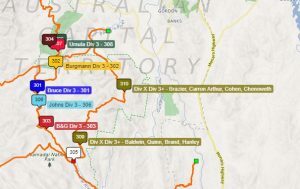 These divisions are numbered according to their expected distance and difficulty, with Div 1 generally running 80-100km and Div 7 more like 25-35km. Each team has a Navigator, a Co-Navigator, and two Scouts. After being driven around blindfolded for a while, teams are dropped at the “drop point” and given the co-ordinates for “end point”. They then navigate and run to this location. Immediately after being dropped, the two Scouts spend some time running out to find clues as to their current location. They bring these back to the Navigator and Co-Nav, who are in charge of setting the route and keeping the team on track. Let’s talk about 2012. If you look on the IB Wikipedia page, you’ll see that no results were declared that year. Why? Well, it was quite “a time”. Our understanding from talking to people in the know is that the organisers wanted to make that year special, as it was the 50th anniversary of IB. In a move seemingly inspired by the Hunger Games’ Quarter Quell, they therefore designed most of the courses to be a bit longer. However, then a key property owner pulled out after everything had been set (IB needs to get permission for runners to go through private property). This added tens of kilometres to already long runs. Ultimately less than half of the teams finished, and almost no teams in the higher divisions made it through. 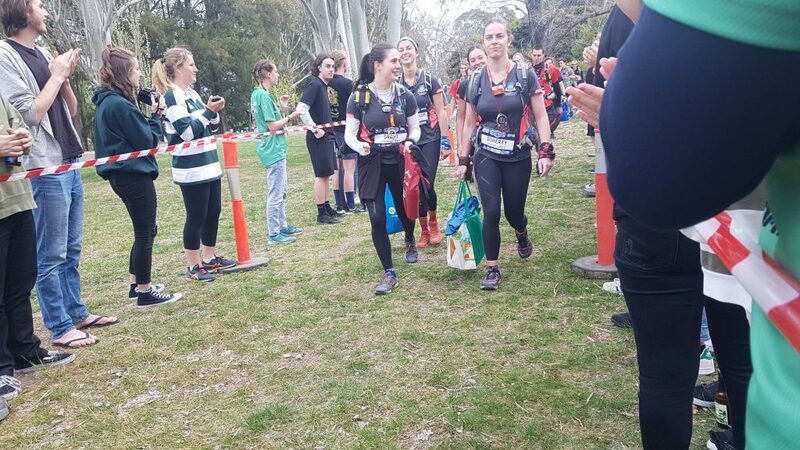 Some runners suffered from severe dehydration – like the Div 5 team in this video, many ran out of water and took a while to find checkpoints or patrol cars. 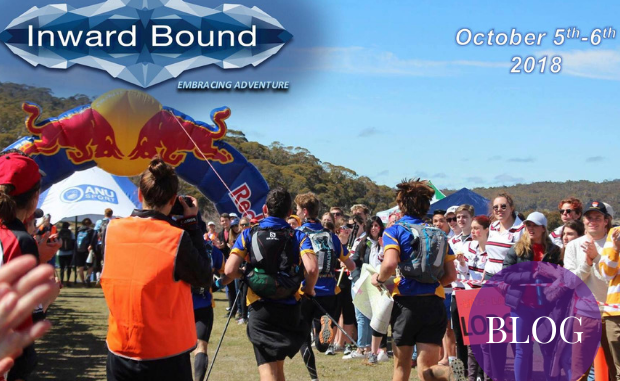 Teams encountered cattle, horses, and rogue pig hunters, and many ran over 100km. 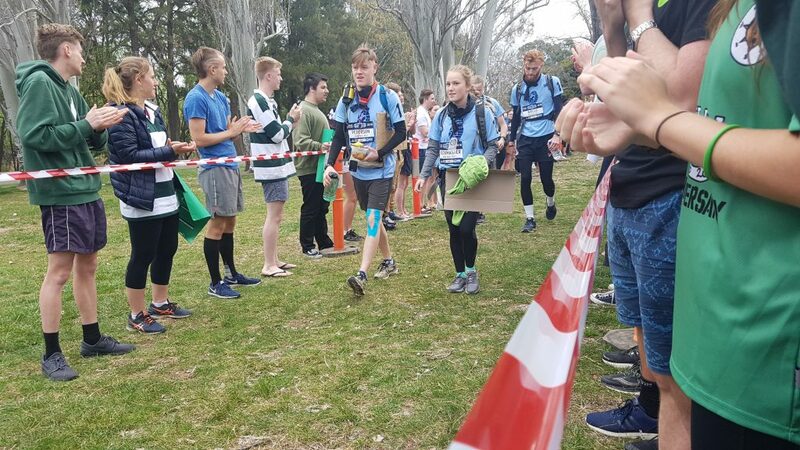 Only one Division 1 team finished – a team from John’s, whose female nav is hailed as an IB legend for getting her team to end point. Submitted by Eliza Croft to last year’s blog. We’ve just seen Div 4 run out from Burgmann. No photos as it’s dark (we attempted to take some and they did not turn out well). Apologies for the delay in posts. One of Observer‘s reporters brought their dog. 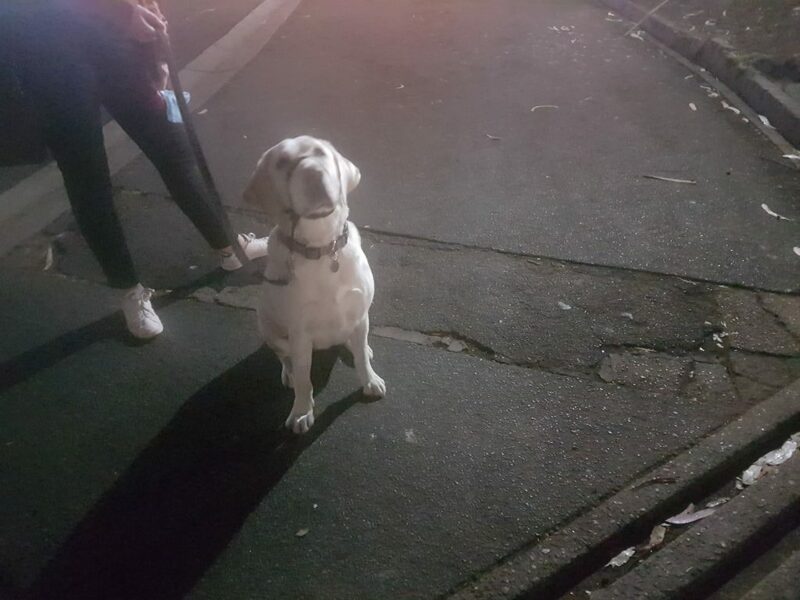 She is a good boy. Let’s talk a bit about the history of IB. The competition began in 1962 as a race between ANU students and ADFA cadets. 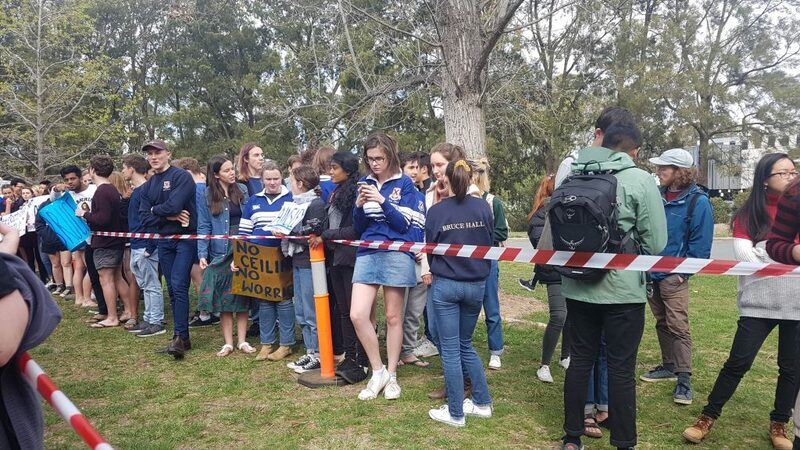 They began in south Canberra and finished at Bruce Hall (rip), then the only undergraduate hall at ANU. The winning team apparently hitchhiked back to Bruce. After a few years, the race became more bush-oriented. Some time before the 1980s, Ursula Hall began the tactic of jogging most of the course (note that the technique being started by Ursula Hall is an Ursies legend which Observer has not been able to confirm). ADFA has been involved in IB sporadically. They entered a team in 2016, but apart from that haven’t competed in the past few years. We’ll bring you more IB history facts throughout the next 24 hours. Something to do in downtimes – a book, cards, or a footy perhaps? Finally, you should bring cash. 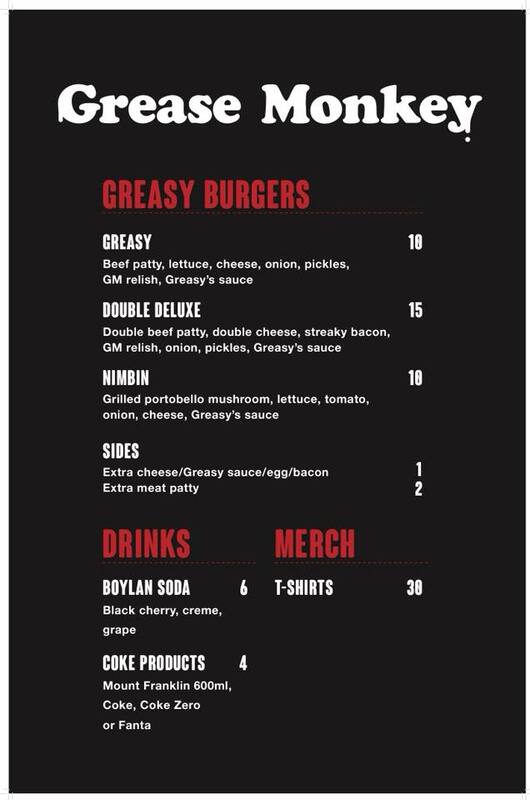 Grease Monkey will have a stall at Endpoint, and given previous years, they’re likely to be the only food vendor within walking distance. 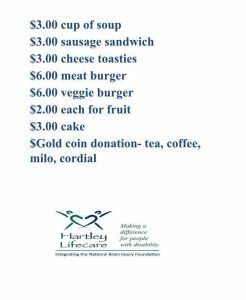 Their basic menu is below. Note, however, that colleges are likely to provide a BBQ for their residential students. This compares relatively unfavourably with the 2017 Endpoint, when burgers were available for 6 dollars and an unlimited food ticket was available for 18 dollars. 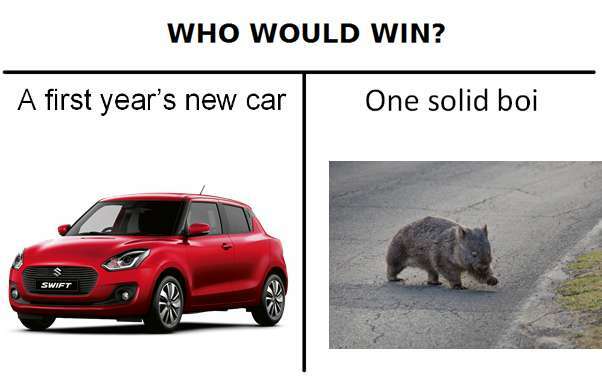 We will never stop memeing about Johns Div 1 2015. Submitted by Michael Turvey to last year’s blog. Div 3 has now been sent off, unfortunately no photos as it’s getting a bit dark. We now have a two hour gap before Div 4 at 8:50. Div 3 included Dave and Julie Baldwin’s Div X team, which I am told is confidently expected to absolutely blitz their division. Remember you can message in content for the blog to our Facebook page. It is really cold out at Send Off now btw. If you’re coming, wear a jumper. Let’s briefly speculate wildly about Endpoint. In 2015, Endpoint was at Captain’s Flat. In 2017, it was at Dalmeny Beach. Last year, it was at Denison Campground, in the Snowy Mountains. Presumably it won’t be in any of those locations again. Obviously, we have no idea where Endpoint will be this year. The Inward Bound Facebook page has posted one picture of Endpoint at night, showing artificial turf. Draw your own conclusions. We’ve been told that Endpoint has very limited parking this year, with drivers having to arrive before 7 or after 9 to avoid clashing with buses from colleges. 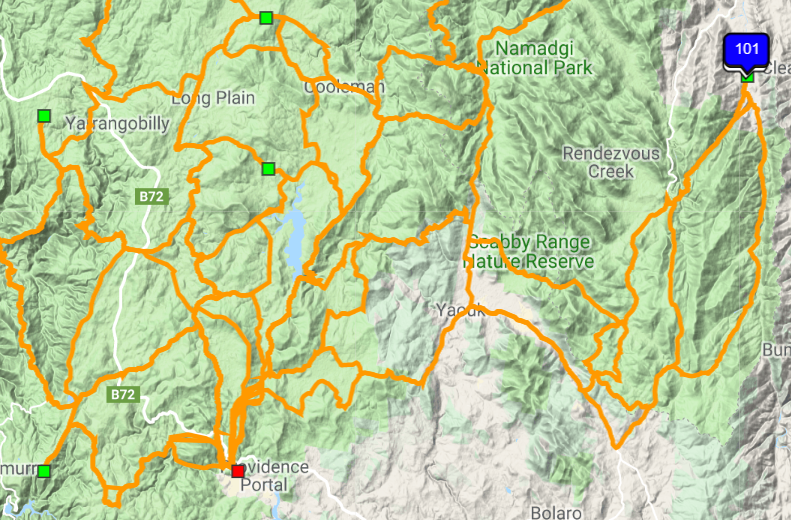 One could of course go through the list of closed areas in NSW parks for potential closures, if one has the time. In other news, an enthusiastic Brucie has let us know that Bruce’s slogan this year is “Bruce Hall, Always Moving”, a residential-themed motto following on from last year’s “No Ceilings, No Limits”. Thanks very much for the tip! Now we’ve taken a look at 2016 and 2015, lets return to 2017, and specifically Griffin’s stunning win in Div 1. The full race map (you can watch the movement of each team) is still up on the IB website here. 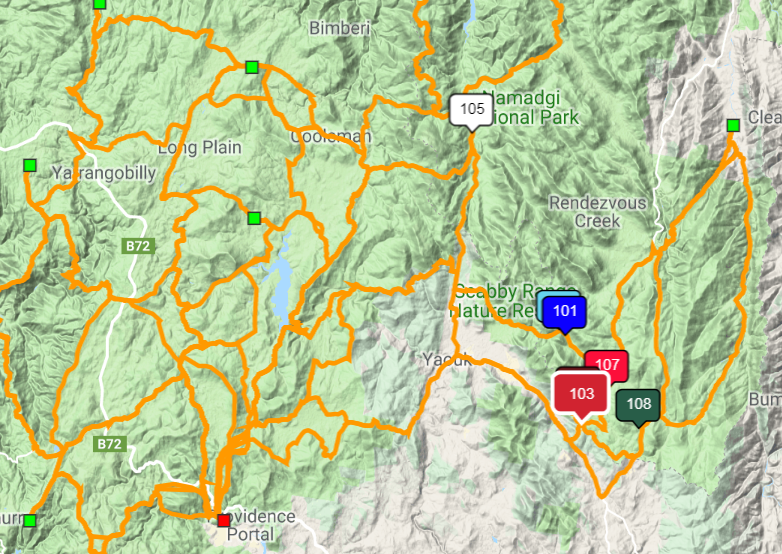 The Div 1 teams were dropped a little over 50km north-east of Endpoint (which is marked in red). 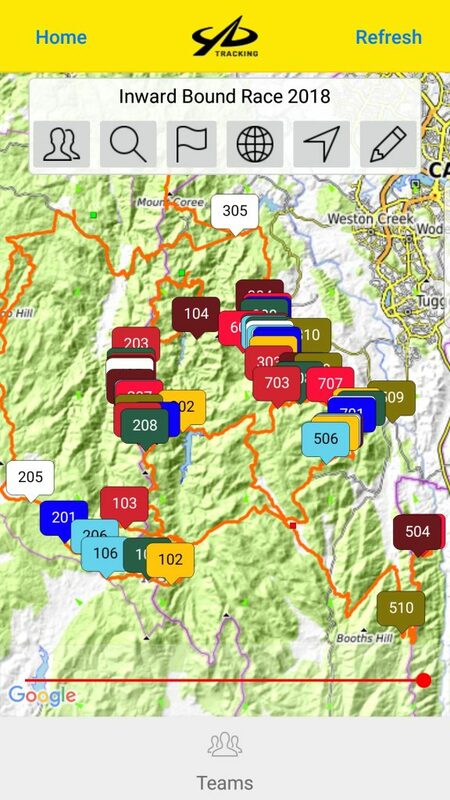 Griffin (105) quickly moved in a different direction from all the other teams, bush-bashing west while the others ran on a trail south-west. Like, what is Griffin actually doing? Ok. Firstly, I’m no expert. I could be completely wrong. But for the life of me I can’t work out what Griffin Div 1 (the white 105) is up to. The state of play at 11:37PM. 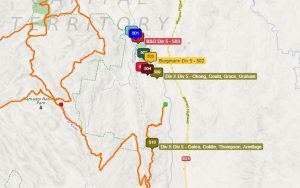 Griffin finally reached a trail at around 2:30AM, by which point the other teams had made significant southerly progress, with B&G (103) seemingly in the lead. By 4:45, Griffin had started to move west, while B&G had pulled clearly in front of the other Div 1 teams, making it effectively a two-team race. As supporters awoke, the two were racing towards Endpoint, and it appeared at 8:30 that B&G would again win, for what would have been their 5th successive Div 1 victory. 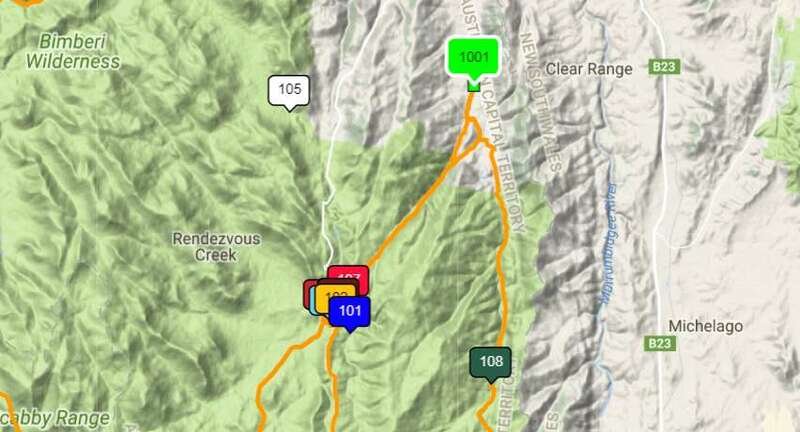 However, Griffin managed to overtake them, arriving at Endpoint at 10:54, just 4 minutes before B&G at 10:58. It’s hard to emphasise enough just what a surprise Griffin’s win was. The college had never before won Div 1, and B&G had been absolutely dominant over the last five years of the competition. Their victory demonstrates that unconventional navigation choices can pay off, and you can never count out any team. We’ll also take the opportunity to revisit our discussion of 2015 (lets be honest, I’m never not going to take the opportunity to talk about Johns in 2015). 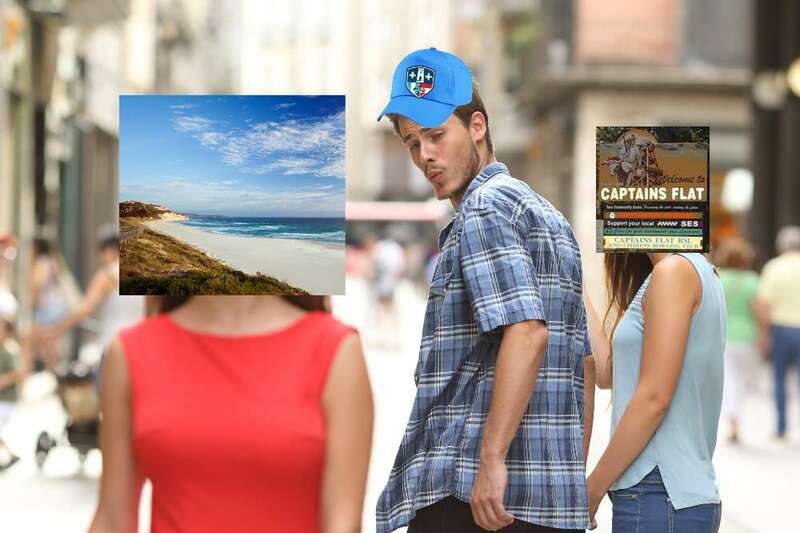 This was the year that Johns’ Div 1 team, infamously, got lost and ran the wrong way, only realising their mistake once they had reached the beach. Endpoint was a long, long way inland, in Captain’s Flat. 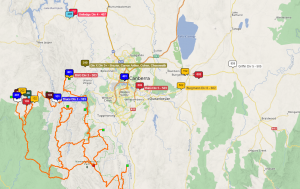 You can follow the runners from all teams at that year’s tracking site, which is still up. 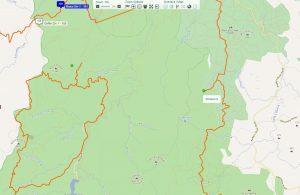 Following Johns’ Div 1 team is funny or tragic, depending on your perspective – from about 3AM to 8PM, they wander around back and forth in Monga National Park. Despite repeatedly telling volunteers they wanted to finish, they ultimately were forced to give in, and were picked up by a car. Johns was not the only team to run into trouble that year. Fenner, Griffin and Johns all failed to finish Div 1. Why did this happen? We had a chat with a runner from 2015. Div 1 was dropped on the edge of the course boundary, not all colleges had maps that far out. 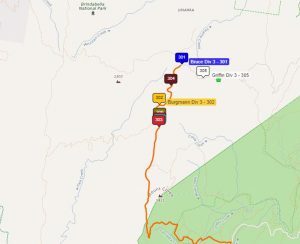 Some divs may not have been able to figure out where they were, or just struggled to plan routes with the maps they had. To clarify, most colleges had some maps for that far out, but not everyone had the high detail maps. There was also problems regarding access to land, particularly in Div 2. So, we have some time, so lets quickly run through the 2016 results, once again shamelessly ripping off our content from last year’s blog. B&G won the Bill Packard Trophy for Div 1 comfortably, with Ursies an hour behind. They also took out the overall Inward Bound trophy in a tight race, with 114 points to Johns’ 109. There was only one official complaint in 2016. 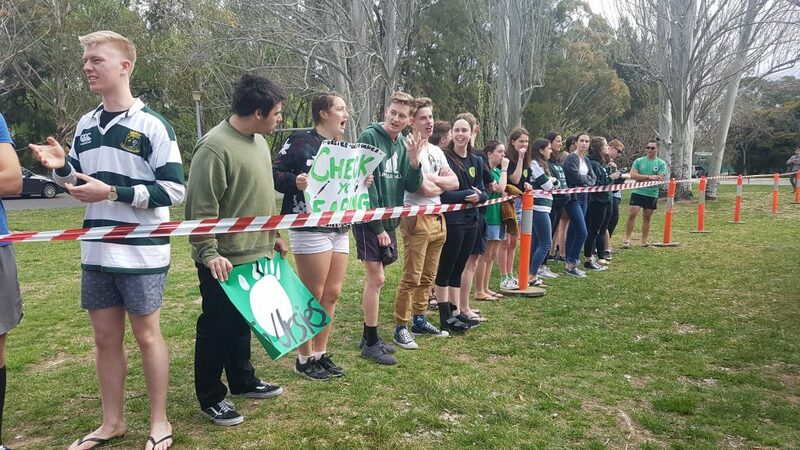 A Johns Div 5 competitor accused the B&G Div 1 team of having separated more than 50 metres, breaking the rules. The complaint alleged that one member of the team had separated 300m from the rest of the team. Given there was no supporting evidence or other details, the referee dismissed the complaint. The complaint is interesting in light of the final results – if B&G’s team was disqualified, Johns would have won the overall trophy. You can read the referee’s full ruling here. Here’s ‘odds’ for Divs 2 and 3, again from the IB Memes for Long Distance Teens page. So what’s new in IB this year? The biggest change is Division X, a division intended for ex-residents. The full 2018 IB rules can be found here, but lets quickly focus on the addition of Div X. The Inward Bound team described the new division as “designed to keep the IB community, spirit, and involvement alive for participants long after they’ve left college”, by providing an opportunity for ex-residents to run. Each college can currently have 3 ex-residents in their 7 teams, but Div X provides an opportunity for more to run. Div X teams are scattered throughout the divisions, but we understand that the majority are in Div 5 this year. Div 2 is out, and now we have a long break before Div 3 gets sent off at 6:50. Above we see our first Div X team of the day! We’ll be talking about Div X, which is new to IB this year, in our next post. 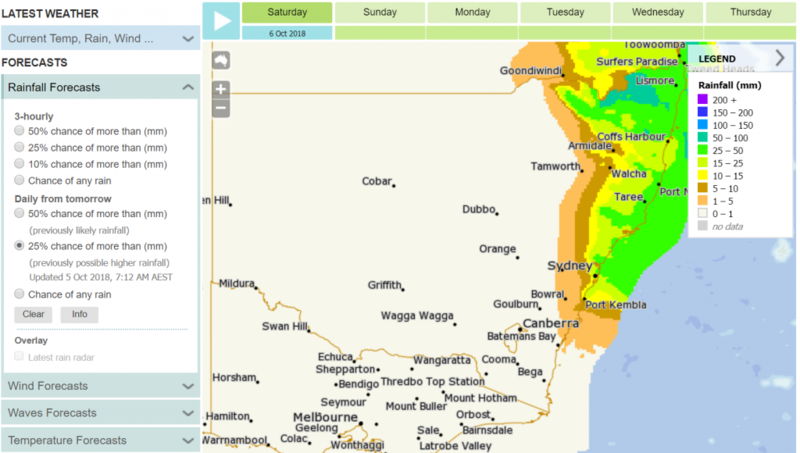 So, that somewhat begs the question: what’s the weather going to be like tomorrow? We’re hampered a bit in our forecast by the fact we have no idea where Endpoint will be. But we can generally say that wherever it is, it’s probably going to be dry. 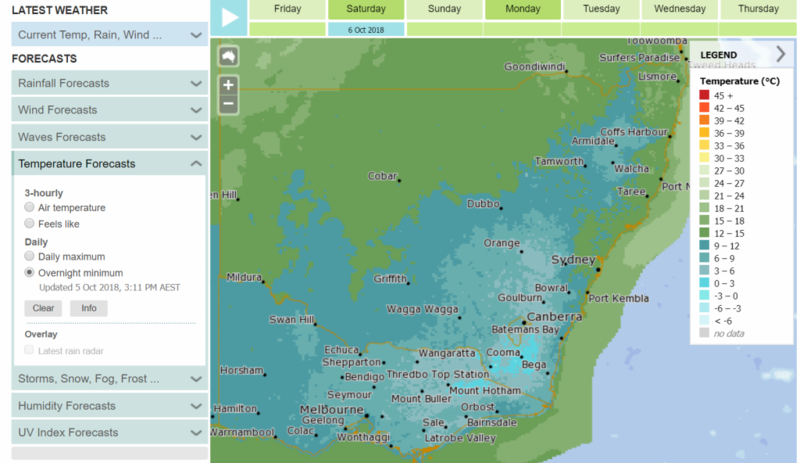 The bad news, for runners at least, is that it’s likely to be chilly overnight. Lets talk about college slogans for this year’s IB. 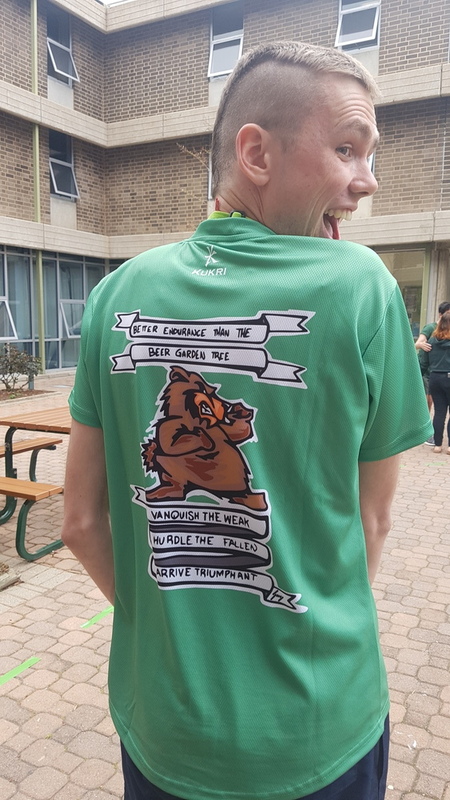 Ursies Div 3 runner Rory O’Donnell models his IB shirt for us. We’re not sure about Fenner’s, Bruce’s or Unilodge’s yet, while Ursies’ is shown above. If you know the others – send them in! Update at 5:08: We’re told by an enthusiastic Brucie that their slogan is “Bruce Hall, Always Moving”. Div 1 is out! They’re on the buses to their destination now. Next up, Div 2, at 3:50PM. Supporters start to line up at Send Off for the Div 1 sendoff at 2:50. I’ve been sent Johns’ Inward Bound video – much as it may pain me to say it (disclaimer, one-eyed Ursies resident here), it’s very cool. So, as we’ve just mentioned, runners were given rather a surprise at their briefing earlier this week to discover that there are no donuts this year. What are donuts? You’ve probably worked out we’re not talking about the kind Homer Simpson is fond of – in IB terminology, donuts are guidances to how far IB teams are dropped from Endpoint. Last year, for instance, the donut for Div 7 was 10-29km, while Div 1’s donut was 1-65km. How are these used? When teams are dropped at their starting points, they’re given the co-ordinates of Endpoint. Navs then traditionally will draw two concentric circles on the map, centred on Endpoint, using the two distances from the donuts. They know that they will have been dropped somewhere in the area between the smaller and larger circles. 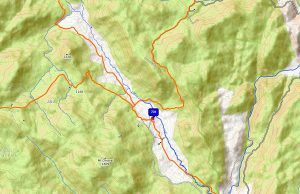 This allows them to narrow the potential area where their starting point might be – and work out where they are, faster. What’s the impact of losing donuts? It’ll make things more difficult for navs, obviously, but one current and former nav who spoke to Observer told us they don’t think it’ll make too much of a difference. They’ve been moving away from using useful donuts in recent years, last year the donut for Division 3 was entirely pointless and Dave Baldwin [the 2017 course setter] walked past while I was drawing it cackling evilly at my plight … So while the year-on-year impact is minimal, the overall impact is it makes it harder to work out where you are at the drop point compared to say five years ago probably. Here’s the schedule for the send offs for the rest of the afternoon, from the official event for the IB Send Off. You may be wondering why the times for send-off are staggered, and why Division 1 has to leave so freaking early (seriously, I barely made it there in time). 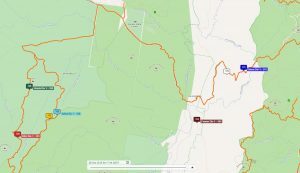 Well, that’s because all the divisions run different distances (as you probably know, tbh), and while the specifics are still secret, we know that Division 1 will be dropped off up to 65km from Endpoint – meaning maybe around 100km of actual running! This year, we don’t know how far Div 1 will run, as there have been no donuts for any of the divisions this year. More on what donuts are, and why their omission is notable, shortly. 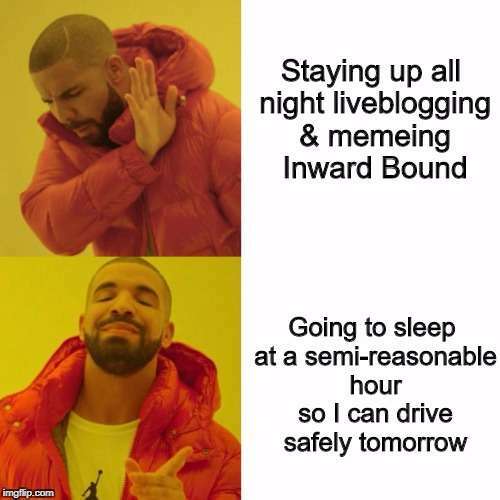 This is probably a good time to point everyone towards the excellent Inward Bound Memes for Long Distance Teens Facebook page. This year, they’ve suggested sportsbook-style odds for each division – take these with several large grains of salt, of course, but they are an interesting perspective on teams’ chances this year. Here’s the odds for the overall Inward Bound Trophy and Div 1 results. So, while we wait for things to get started, lets talk about last year’s results. Griffin won Div 1 and the Bill Packard Trophy through an unorthodox route choice, which we’ll talk about more later. This broke B&G’s 4-year reign over Div 1, beating them by just four minutes on the day. B&G did have some consolation, in that they won the overall Inward Bound Trophy, for the second year in succession, in a tight victory over Burgmann. We also want to give a shout out to the official Inward Bound Facebook page, which has a lot of useful information on the event, and from where the graphic for this liveblog is sourced. They’ve been doing a long-running series speaking to Inward Bound legends over the year so far, which are really fun reads. Welcome to Observer‘s liveblog of Inward Bound 2018! We’ll be liveblogging send off this afternoon and the race itself tomorrow, providing updates on the race, analysis from ex-runners, and some memes, probably. Send Off is this afternoon at Burgmann, and you can find more information about it here. If you can’t make it, don’t worry, we’ll be giving you updates and photos from right here on the blog. The first send off, for Div 1, will take place at 2:50PM. Our email is currently suffering some technical issues, so if you want to provide any content for the blog – if you’re an ex-runner or coach who’s willing to share your experiences, or if you’re keen to share some IB memes, feel free to send them to Skanda Panditharatne or Eliza Croft on Facebook Messenger. If Facebook isn’t your bag, you can also email things into [email protected] (pls don’t spam me). Thanks for joining us today, and we’re looking forward to blogging with you over the next couple of days!